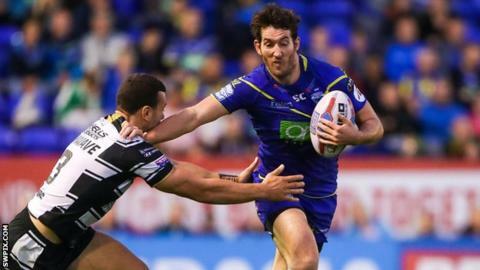 Warrington Wolves held on to beat Huddersfield Giants and seal their place in the Super League play-offs. Jake Mamo scored a first-half hat-trick, but Ryan Atkins and Bryson Goodwin tries kept Warrington in touch. Stefan Ratchford and Tom Lineham crossed for Wire after the break, and Goodwin restored their eight-point lead after Lee Gaskell's try for Giants. Joe Wardle went over to reduce the gap to two points, before Danny Brough left a late kick to equalise just short. Brough had earlier missed four challenging conversion attempts, with the misses proving decisive at the end of the game. The visitors matched the hosts throughout the contest, and Mamo's blend of pace and power was too much for the left wing of Warrington's defence to handle in the first half. But Wire improved defensively after the break, and Ratchford and Lineham looked to have the hosts on course for a comfortable second league victory in a row following their Challenge Cup final defeat. Huddersfield fought back as Wardle scored from Gaskell's grubber kick, but Brough could not rescue a point as his kick from the halfway line failed to reach the posts. "It's disappointing but there are a lot of positives to take out of the game. "We hung in there even though Warrington were probably the better side the majority of the second half. "We found a way to stay in the game, we scored a couple of tries and all of a sudden the game was there to be won, so it's a big improvement on what happened last week." Warrington: Ratchford; Lineham, Goodwin, T. King, Charnley; Brown, Roberts; Hill, Clark, Cooper, Hughes, Atkins, Livett. Replacements: Philbin, G King, Patton, Pomeroy. Huddersfield: Rankin; Mamo, Turner, Wardle, Senior; Gaskell, Brough; Ta'ai, O'Brien, Matagi, Mellor, Roberts, Hinchcliffe. Replacements: Leeming, Lawrence, Clough, Smith.